You are here: Home / Elderflower / Protein pancake, my new fave! Protein pancake, my new fave! But this being a blog about all things healthy, I will move on from the alcohol! But it is nice! So when I got back from said grocery trip with my roast chicken for the cat (I know I know, don’t even say it), and white beans for my lunch, I was starving like marvin. I had been reading reviews of the Tone it up Protein pancake, and as they were kind enough to add the recipe to their blog I gave it a try. At first I thought it might need syrup, but the mashed banana really made it lovely. Mix it all up by hand or handblender, and then cook like a normal pancake (American variety). Once the top starts to bubble up, flip. I added the blueberries into the pan around the pancake once I flipped it, and served with more blueberries and raspberries and it was lovely! Needs no sweetener or syrup, I am a big fan now! The recipe from the TIU folks is slightly different, see the link above to check it out. This will be a staple on my menu from now on, well on the weekends and when I work from home at any rate! Really filling and lovely. Going to try a recipe from my new cookbook later, Super Natural Every Day by Heidi Swanson, White Beans and Cabbage, doesn’t sound inviting from the name, but the recipe picture looks delish and who doesn’t like white beans, cabbage, onions and potatoes. I have had a mad craving for bacon so might make the dish with some lardons or make it with some back bacon on the side. Will post later to let you know how it turns out. 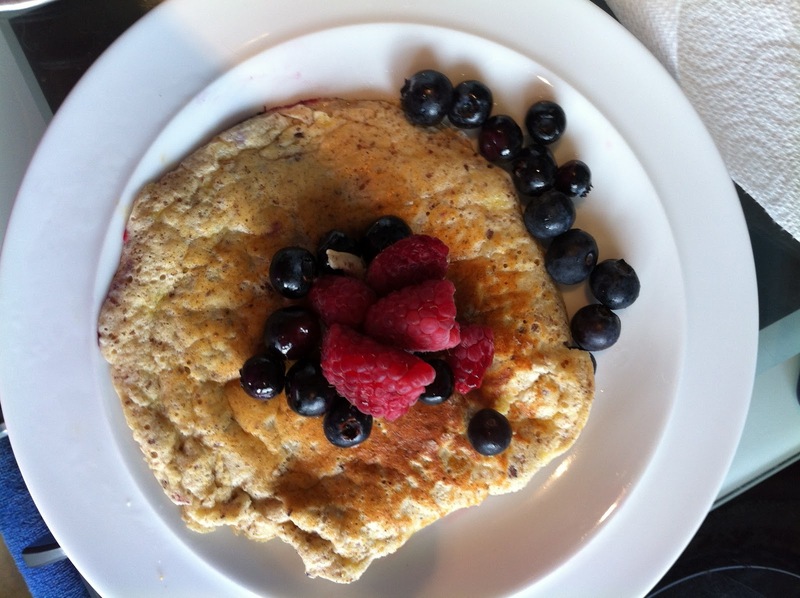 I think the TIU protein pancake is the best recipe that I have tried (for protein pancakes). I don’t like their recipes which include cottage cheese or Greek yogurt though. Something about the texture doesn’t sit well with me. So I stick with the basic recipe and I love it. Have you seen their new protein powder? I’d like to try it, but I need to wait for another payday to purchase.